Roughly $2 million was knowingly loaned to Japanese gangsters. More than 30 executives at Mizuho Financial Group, Japan’s third largest bank, will be held accountable for making loans to the country’s organized crime syndicates, known as the yakuza. Japan’s Financial Services Agency (FSA), which had been investigating the bank since last December, also demanded that Mizuho submit a business improvement plan by Monday. The financial watchdog said that Mizuho executives used the bank’s consumer credit affiliate, Orient Corp, to lend 200 million yen ($2 million) to yakuza members – mostly in the form of automobile loans. According to AFP, Mizuho Bank chairman Takashi Tsukamoto will step down, but retain his position as head of the bank’s parent company. Current Chief Executive, Yasuhiro Sato, will forfeit six months’ salary. An unnamed compliance executive will also be removed from the board, while other managers involved in the scandal face pay cuts. After being pressed by the FSA, Mizuho management initially denied any knowledge of the gang-affiliated lending. Earlier this month, however, executives involved in the scandal admitted to having knowledge of the illegal transactions – which dated back as far as 2010. Sato, upon reversing his claim of innocence, said that he “was in a position to know” about the loans due to his presence in the boardroom. As a banking executive, the loss of six months’ pay is viewed by many as an incredibly small slap on the wrist for providing financial assistance to the Japanese mafia. The Japanese government passed yakuza-exclusion ordinances in 2011 that make it illegal for individuals or businesses to work with members of organized crime groups. Although it isn’t illegal to be a yakuza, doing business with them can carry a 500,000 yen ($5,000) fine and a year-long jail sentence. The U.S. also passed an executive order that requires American banks to freeze yakuza assets. Bloomberg reported that the U.S. Treasury Department has frozen about $55,000 tied to Japanese gangsters. Yakuza membership is substantially lower than it was a decade ago, a direct impact of the nation’s toughening laws. In 2011, membership was down by 11 percent, to 70,300 – falling another 10 percent to 63,200 in 2012. In 2004, membership peaked near 90,000. 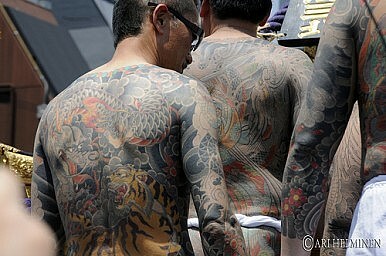 The yakuza are generally tolerated by authorities and the Japanese population at large. They are mostly known for protection rackets, loan-sharking, and prostitution. The most prominent “families,” including the Yamaguchi-gumi, even own office buildings. Compared to western-style gangs, though, yakuza rarely target civilians – even with their visible presence, violent crime remains a rarity in Japan. Class action lawsuits in the U.S. and Canada target a Japanese banking juggernaut.